But now, it appears another question has emerged with regards to the spiky fruit, and it concerns how you eat it. If you’re anything like me, you’ll have been chopping up pineapple into little pieces in order to eat the fruit in the least messy way. It might take ages but it’s the right way to do it, right? Wrong, because a video has emerged which shows the ‘correct’ way to eat the fruit – and it has left people shook. 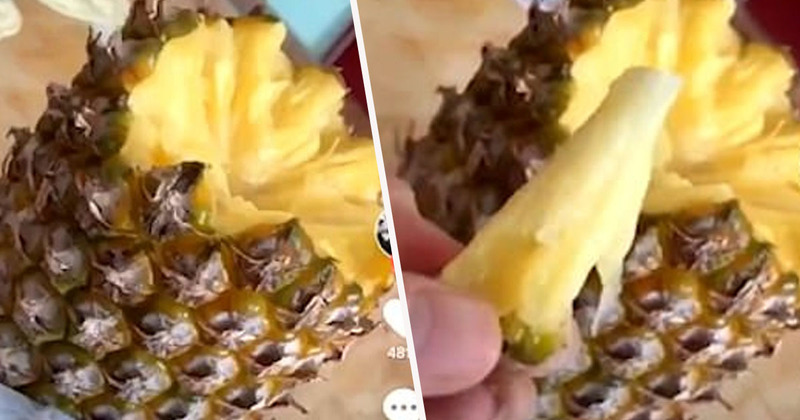 Originally shared on TikTok by user Dillon Roberts, the video shows someone pulling out sections of the pineapple by the skin, piece-by-piece, after slicing off the top. Incredible, right? Who knew that pulling at the skin towards the centre of the fruit could give you perfectly-sized pyramid-shaped pieces, without even needing a knife?! Like I said, people were shook and could not get over this revelation, hence resulting in the tweet getting a massive 135K likes and 43K retweets in just a matter of days. …so, we’ve been EATING IT WRONG? While we’re all blindsided by this revelation though, one Twitter user helpfully explained why we’re able to do this. You can do this because pineapples are actually berries. As the fruit grows the individual berries coalesce together. Each ‘eye’ is a single individual berry. they may seem fused together, but if you start from from the top, you can pluck each eye one by one. Well, there you have it. My mind is officially blown and I think I need to go and buy a pineapple just to see if I can actually do this. I know, I have no life.